There are two types of professional sound meters: "Class 1" and "Class 2". Class 1 instruments are the best but also very expencive (more than 1000 euro). These instruments are typically used for science, technical research and law enforcement. Most national standards permit the use of "at least a Class 2 instrument". The prize of Class 2 instruments starts at 300 euro. A lot of cheap instruments can also be bought for 100 euro or less. These instruments do not comply with the IEC 61672-1 standard and it is often very difficult to get any documentation on their performance or accuracy. Cheap instruments might be used to indicate the silencers performance but they will not be good enough for technical verifications at World Cup competitions. Sound level meters are divided into two types in the: ANSI - IEC Atlantic divide. 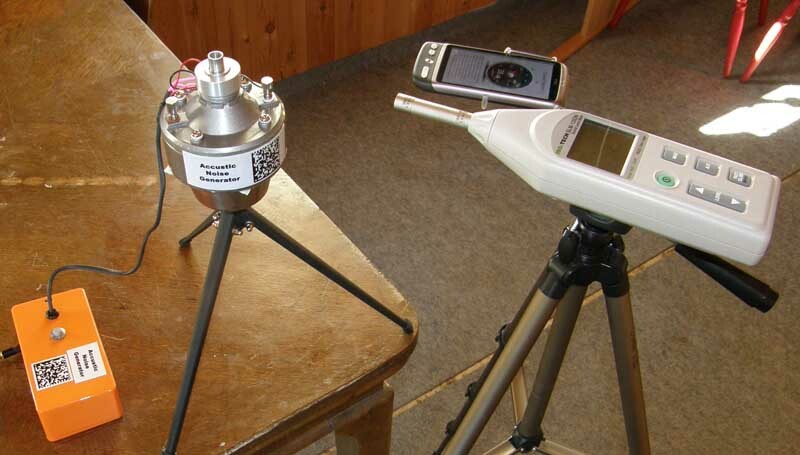 Sound level meters that only meet the ANSI specifications can not be used. There is no possible way to convert the result from the american ANSI system to the international IEC system. For the silencer test the meter must be set to A-weighting. The A frequency weighting is commonly used for the measurement of environmental and industrial noise. The meter must be set to mode "Slow" to get a stable readout. In this mode the instrument uses a 1 second time-constant to smooth out fluctuating levels. A windscreen must be used if the measurement is done outside where the wind noise can cause errors. The instrument can be mounted on a camera tripod to make it easier to adjust the distance and get a more stable measurement. shown here was 350 euro. Some low price SPL meters can be found at Radio Shack . General problems for these instruments are problems with the response to sound at different frequencies. audioXpress did a test on some of these instruments and found them to be good at frequencies up to 1 kHz. For higher frequencies they deviate a lot (typical 10 dB) from the actual sound pressure level. As most of the noise from combat engines or above 1 kHz this deviation will have a high impact on noise measurements and it will be difficult to reproduce or compare results from different instruments. It will also be problematic to measure changes to a silencer with this type of instrument. Changes at high frequencies will be corrupted by the instrument. It will not be possible to see if a measured change in sound level is based on a change in frequencies or if it is a real change in sound level. 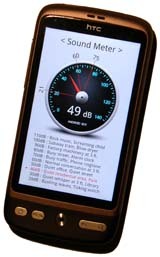 A lot of Sound Level Meters applications are available for smartphones. They can be downloaded for free or at a very low cost from apps stores. A general problem for these apps is that the microphone have been optimized for the use in the telephone and this makes it difficult to use it for measuring sound at high sound pressure. I did a small test with two different apps for my Android to see if a smartphone could be used for measuring combat noise. The two apps tested was Smart Sound from Android Boy's Lab and deciBel by Peter Tschudin. The diagram shows the difference between the actual noise level on the horizontal axis and the measured noise level on the vertical axis. A correct frequency response should be a straight line like the red line. A Class 2 instrument would only divide from this red line by 1 dB or less. The smartphone does not measure accurate with any of the apps. At high sound levels the phone seems to level out to a flat response. This is probably some kind of compression function in the hardware. This is a relevant feature for a phone but makes the smartphone useless as noise meter at high noise levels. 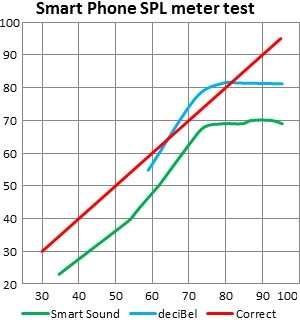 This test only shows the smartphones response to the sound level. 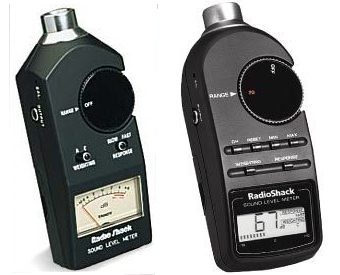 The response to different frequencies is probably even worse than the low price SPL meters from RadioShack. If you have a smartphone these apps might give you an indication of how difficult it is to measure noise but it can not be used for scientific purposes.